FM Ricardo D�Arruda is originally from Argentina. 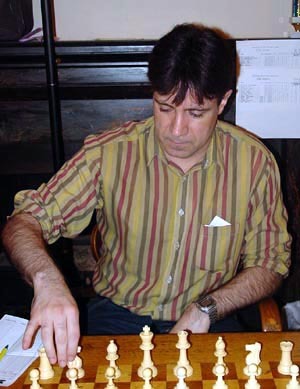 One thing you might not know about D�Arruda is that he was once very active in postal chess! He was ranked as high as number 2 in the USA in mid 2000. It�s great to see that someone who is skilled at moving soooooo slow is also capable of moving quite fast. Ricardo plays pretty positional variations with the white pieces, beginning with 1.d4. With black he seems to like playing the Schvenigen, even allowing the dreaded Keres attack. D�Arruda has come out on top in a few of the NY Masters, winning one event by beating super solid GM Kacheishvili in a key game.